The NordicTrack Commercial 2450 Treadmill is ON SALE! The NordicTrack Commercial 2450 treadmill combines a serious exercise machine with features that take the monotony out of running in place. Instead of staring at your living room wall, you can enjoy the convenience of a 10″ browser display at your fingertips. This machine lets you view custom running routes or iFit Live adventures directly on your console display. 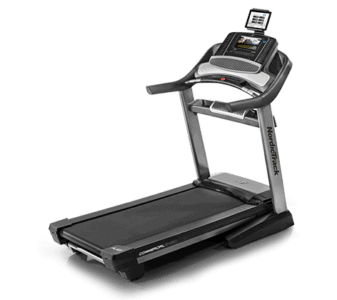 NordicTrack has long been a trusted brand in the treadmill industry. They come from parent company Icon Fitness, which also brings us the winning brand, ProForm Fitness. They are often able to sell more machine at a lower price because this company is the LARGEST manufacturer of fitness equipment in the world. This machine is currently priced at $1999.00 and comes with Free Shipping ($250 value), 1 year of free iFit membership, and a 30-Day Money Back Guarantee. $300 OFF the Regular Price! 10” Smart HD Touchscreen – The browser is used to interact with the treadmill. This allows you to view your iFit workouts directly on the treadmill. You can create customized workouts. When you initially set-up your account on iFit Live, you define your fitness goals like running a 5k race or losing weight. Based on those goals, you can select workout routines designed by professional fitness trainers like Jillian Michaels. The workouts are progressive and last from 2-4 weeks. They include audio coaching for further motivation. After each workout, your stats are uploaded to your iFit Live account, which allows you to monitor your progress towards your fitness goals. You can create customized routes on Google Maps and your NordicTrack Commercial 2450 treadmill will simulate the terrain with the incline feature. As you run, you can view your progress on the Android browser. Google Maps will provide a street level view of your running route. There is also a library of existing routes through popular city-scapes and national parks. Once again, your results are tracked onto your iFit account. iFit Live has an HD video Library of world famous trails through National Parks and walks along popular ocean fronts. Like Google Maps the treadmill will simulate the terrain as you run. This gives you a more realistic experience than the Google Map app. Note: This machine comes with 1-year FREE iFit Membership. After the first year, you will need to pay a subscription fee. Learn more here. 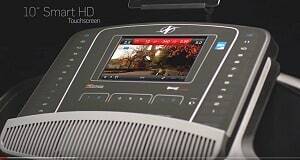 MP3 Input and Speakers – NordicTrack offers some of the best sound systems installed on a treadmill. Many treadmill companies cheap out on the speakers and they are barely audible. 4.0” HP Motor – Let’s just say – this is a bit of an overkill for a motor in a residential treadmill. No matter how much you abuse this motor, it will take it and more. 22” x 60” Treadbelt – The Commercial 2450 has an extra wide 22″ treadbelt with a 60” length that gives you a nice comfortable zone for long running strides and interval training. 15% Incline & 3% Decline – NordicTrack is one of the few treadmill companies that allows you to both incline and decline the deck. This gives you the ability to simulate running up and down hills. It further enhances the experience of running with Google Maps. Adjustable Shock Absorption – We’re not sure about the logic of this feature. You can turn off the shock absorption so you can simulate running on asphalt, which doesn’t make a lot of sense, since one of the major benefits of running on a treadmill is the reduced impact to your body. However, some people prefer a firmer running surface. Warranty – The coverage is similar to other treadmills at this price range; lifetime frame and motor, 5-year parts and 2-year labor. The NordicTrack Commercial 2450 treadmill is designed to entertain, motivate, and relieve you of the boredom of running in place. From that perspective, it does a better job than any other treadmill on the market. On the other hand, how does the Commercial 2450 treadmill hold up to the rigors of running? Over the years, NordicTrack has significantly improved quality control on their machines which is reflected in their strong warranty. 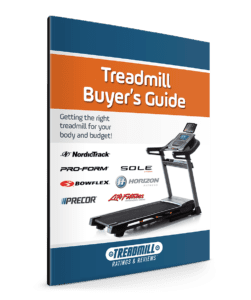 The durability of the NordicTrack Commercial 2450 treadmill is comparable, if not better, than any similarly priced machine. If you are someone who suffers from boredom while running on a treadmill, the NordicTrack Commercial 2450 is a great answer. This treadmill takes top honors for being feature rich. You may also want to check out our Best Buy picks: NordicTrack Commercial 1750 and the NordicTrack Commercial 2950. Go to www.NordicTrack.com for further details! The video review of the Commercial 2450 was taken at the NordicTrack corporate headquarters in Logan, UT. The newest model of the 2450 does not have the large HD Tv that is featured in this video. When was this recorded? The screen that comes with the 2017 model is far smaller. Hi David, that is an older video….we will be at NordicTrack again soon and shooting more videos. Thanks for the quick reply. Still co spidering the 2450 very strongly as the next model up which does have a larger monitor is a bit out of my price range. Are there monitors out there that would do the same thing? What Nordic did as an upgrade was change the 7″ touch screen display to a 10″ now standard. The “Big Screen” monitor that is shown in the video was for High Definition Television. That feature was removed. However, with streaming TV these days probably an IPAD will accomplish the same thing. For the money, the 1750 is probably a better value with the same 10 inch touch screen display.